Prius c is the perfect road trip partner with a powerful Entune Audio system, comfy seats wrapped in an eye-catching available two-tone interior fabric, and an available moonroof to let the outside in. It's the perfect place to hang out with friends and brainstorm that next world-changing idea. Hey, chilly nights are no excuse for not going out. 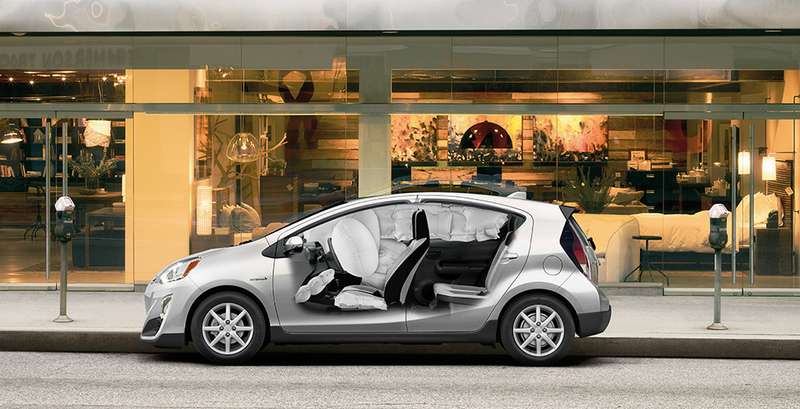 Give your Prius c an added touch of comfort with available SofTex-trimmed seating with heated front seats. 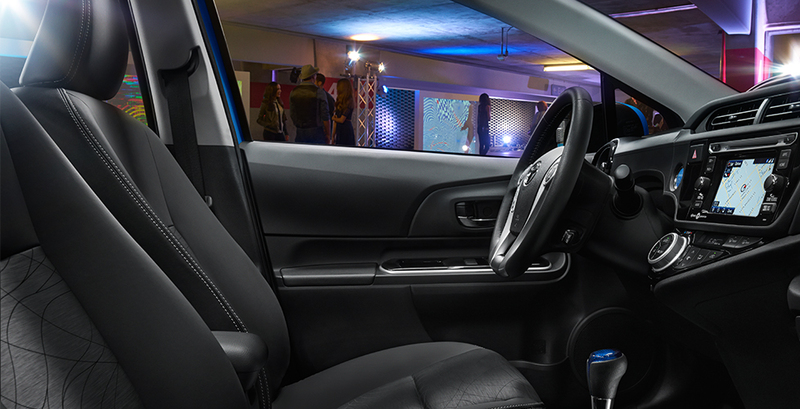 Plus, view your surroundings frost-free with available heated power outside mirrors. Prius c cranks up the attitude with an all-new body kit. Painted in a contrasting black, this kit features a lower front lip spoiler, side skirts and new rear bumper fascia. It's one stylish touch guaranteed to make everyone do a double take. This is style you can count on. Prius c stands out with standard single-LED projector low -and high-beam headlights and available LED fog lights set in an aggressively styled grille. 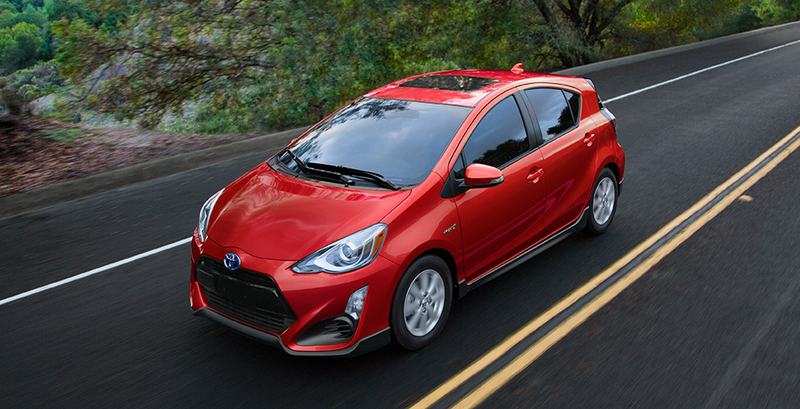 Prius c helps you leave a small footprint while making a big impression. Trying to set a hypermilling record? You'll want your eyes on the road. 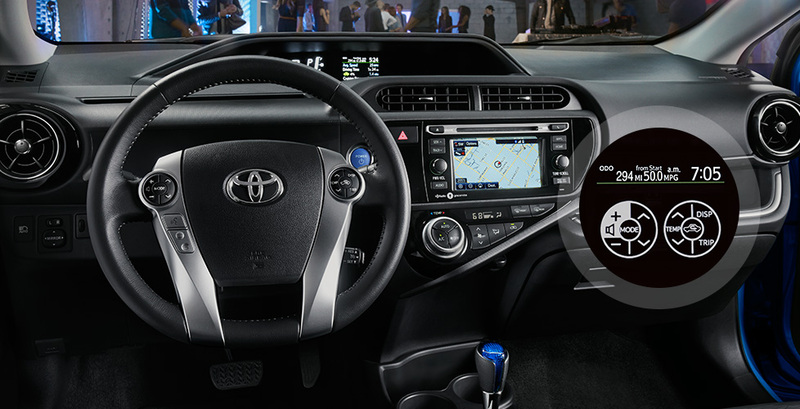 This available feature puts a duplicate image of steering wheel controls on the Multi-Information Display, so you know if you're pressing the button you want. Advanced features like the available Entune™ Premium Audio with Integrated Navigation 12 and App Suite 21 helps keep you connected to your world. Prius c comes standard with nine airbags, including a drive and front passenger Advanced Airbag System. In the event of certain severe collisions, a sensor designed to monitor the severity of the impact makes adjustments for the appropriate airbag deployment.